Meswalk is most probably a native of Africa but now it is widely distributed in other parts of the world too. It is found in the semi-arid regions from Tanzania through Egypt and eastwards to Pakistan and India. 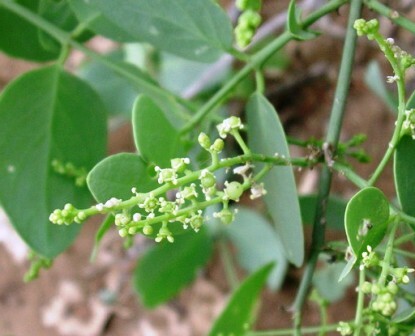 In India, it grows mostly in dry and arid regions and also on saline soils in coastal areas. Meswak bears small fruits which are eaten. But the plant is more famous for oral hygiene which is the reason for it also being called as toothbrush tree. The fibrous branches of meswak has many medically beneficial properties. It has even been promoted by the World Health Organization for this purpose. A large, well-branched evergreen shrub or small tree having soft whitish yellow wood, bark of old stems rugose, branches numerous, drooping, glabrous, terete, finely striate, shining, and almost white. Leaves somewhat fleshy, glaucous, 3.8–6.3 by 2–3.2 cm in size, elliptic lanceolate or ovate, obtuse, and often mucronate at the apex, the base is usually acute, less commonly rounded, main nerves are in 5–6 pairs, and the petioles 1.3–2.2 cm long and glabrous. Flowers greenish yellow in color, in axillary and terminal compound lax panicles 5–12.5 cm long, numerous in the upper axils, pedicels 1.5–3 mm long, bracts beneath the pedicels, ovate and very caduceus; calyx 1.25 mm long, glabrous, cleft half-way down, lobes rounded; corolla very thin, 3 mm long, deeply cleft, persistent, lobes are 2.5 mm long, oblong, obtuse, and much reflexed; stamens are shorter than corolla, but exserted, owing to the corolla lobes being reflexed. Fruit a drupe, small, 3 mm in diameter, globose, smooth, pink to scarlet when ripe. Seed 1, pink to purple-red and are semitransparent when mature. 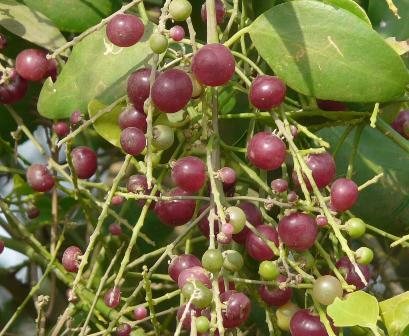 Meswak fruits are sweet and edible. A fermented drink is reported to be made from the fruits. Fruits possess deobstruent, carminative, diuretic, lithontriptic, and stomachic properties and are used in biliousness and rheumatism. 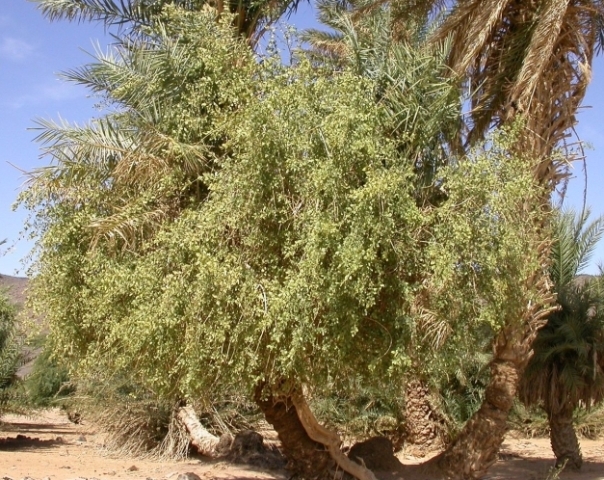 People in Sind(Pakistan) believed that mesowak fruits have a good effect on snake bite. The leaves of meswak are cooked as a vegetable in the eastern tropical Africa and are used in the preparation of a sauce. Tender shoots and leaves are eaten as salad. Meswak seeds are oily and contain 45-48% yellow fat rich in myristic, lauric and palmic acids. This fat is used for candles and as a base for ointments. It can replace coconut oil and palm oil in soap and detergent manufacture. Meswak bushes are found in tropical and subtropical areas upto 1350 m. This is quite drought resistant plan surviving even at places getting as less as 300 mm annual precipitation. Meswak is very sensitive to frost but can tolerate high temperatures upto 45 C. It prefers sandy to sandy loam soils. It can tolerate saline and alkaline soils including frequent flooding with sea water. New plants are raised from seed. The fruit pulp contains germination inhibitors. The seeds should therefore be thoroughly washed before sowing. The seeds are also quick to germinate and fast to grow. Micro propagation is also successful. The young plants should be transferred to bags or pots after 4-6 weeks of germination. These can then be planted in the field after one year. A spacing of 4 to 6 m from plant to plant as well as from row to row in enough. Meswak trees coppice readily. They can withstand grazing by camels, goats and other animals. Harvesting of branches for toothbrushes is also done.